Let Jack Frost tantalize your taste buds with Irish cream, Swiss chocolate, and peppermint flavor. Made with 100% authentic Arabica beans, this gourmet decaf flavored coffee features a sublime blend of sweet, icy peppermint flavors � perfect for a hot summer day (served with ice) or a cozy evening by a fire. With only 2 calories in each cup, this rich coffee will hit the spot with its chocolate-peppermint undertones and hints of Irish cream. 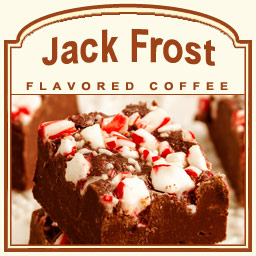 Decadent with each and every sip, your taste buds will crave a visit from Jack Frost time and time again. Roasted and shipped on the same day, this Jack Frost flavored coffee will be packaged in a heat-sealed valve bag to preserve the sweetly cool flavors. Although Jack Frost is known to nip at your nose during the winter season, FlavoredCoffee.com provides this cool blast of flavor year round.